Additional Education Required for Real Estate Agents? 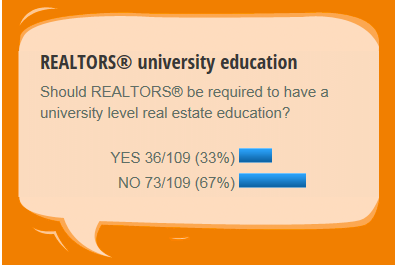 What are your views on real estate agents being required to have a university-level education? As many of you that have already read my bio page know, I am an advocate of requiring all real estate agents to have a university education. In fact, I think the real estate agent training program should be a two year university certificate program within Alberta. To raise the stature of the existing and future real estate agents and bring back a sense of "professionalism" into the industry. To increase the level of confidence by the general public in the necessity of have real estate agents/brokers involved in the buying, selling or leasing of homes, properties and businesses. Maybe if we could accomplish these things it would eventually raise the "industry" to a "profession." This would be similar to engineers, accountants, dental hygienists and nurses instead of being lumped in with plumbers, mechanics, chefs and other trades people (not that there's anything wrong with those trades!). I feel we need to significantly raise the professionalism of all real estate agents -- quickly! Or, honestly there will no longer be a need for them. You might think that the 109 responses was quite low (well it is) but that number is an abnormally high response rate for these polls. Many don't read any communication from the board, and for those that do, they tend not to interact with these polls. To get this high of a response rate, obviously there are some strongly polarized views being indicated. With a third of the respondents voting in the affirmative, I believe this idea will continue to be pushed forward slowly over the next decade by industry members as I had predicted. This number, by the way, is far greater than the current number of REALTORS® that indicate that they have any type of university education in Calgary. Also, the question was posed to only REALTORS®, but I think we can all agree that all real estate agents (including, property managers and commercial agents) should be required to have the same level of minimum education when it comes to real estate. Well, IMO, that would be a good idea and would filter out many realtor agents who are just getting into real estate for the reason that they think it would generate them huge profits and all they know is just selling properties, etc. It would also enhance future realtor professionalism - as being said in the above post and this kind of education could bring more effective realtor agents. No offense but some realtors that are license are just merely "licensed" but they cannot actually do their own duties and responsibilities well.